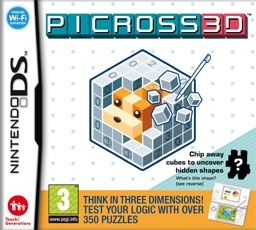 Take the above, rinse, and repeat over 350 times, and you have Picross 3D. It’s not a game with a plot at all, just you reaching benchmarks as you clear tutorials and difficulty stages. You can either play to complete all the main levels, challenge yourself to unlock each level’s two bonus puzzles, or be really stubborn and aim to get three stars (the maximum) on every single level – complete the puzzle (star 1) in what the game has determined is a reasonable amount of time (star 2) without accidentally deleting any of the solution’s cubes (star 3). If you accidentally delete 5 of the wrong cubes in any puzzle, you lose and must start that puzzle over. The tutorial mode is very helpful, and does a thorough job of introducing new players to the puzzles in the game. Upon playing the game a second time, this mode would get annoying, but as soon as you beat any puzzle once, it is available for replay, so starting completely over is unnecessary. The downside to this would be that the completed image is shown before replaying a puzzle, but for that, the game includes a “Random” mode, where you can select the puzzle difficulty, time constraints, and restrict the number of wrong deletions you can make before you fail. This essentially turns the game into a never-ending, portable, electronic book of puzzles, as there is no way that looking at an initial block can immediately bring to a player’s mind exactly what image lays inside it. Towards the beginning, it might feel like the game gives you much more time than you need to complete any given puzzle. 5 minutes? Pssh. I got that thing in 52 seconds. 15 minutes? Took me less than five. By the time you get to the hard puzzles, the limit is much more reasonable. The puzzles in each difficulty mode are also split up properly. When they say Easy, Medium, and Hard, they mean it. I was very impressed by this, as balancing difficulties is something some games don’t manage particularly well. Over the course of the game, it’s possible to pick up on a few tricks – images are largely symmetrical on at least one side and if a human figure is involved, there’s a pattern for the shape of the head that gets reused over and over, to name a couple – but they can only be useful to a point. That one side may be symmetrical, but the other two sure aren’t, and those sides are a lot harder than the first one. Or that human may be doing any number of things – playing hockey, doing gymnastics, dancing, just standing there, who knows? The actual gameplay graphics work fine, and the controls are both intuitive AND cleverly ambidextrous. It uses the style of DS control where the control pad and ABXY buttons are used for the same thing, and the controls (which consist of the top and screen-ward-pointing buttons on either side) match the sides adjacent to the lower corner of the touch screen they are displayed in. To a user interface geek like myself, this makes me very happy. Suffice it to say, the controls are simple, intuitive, and displayed perfectly for the player on the touch screen. The top screen and some of the other background elements are where the whole cosmetics aspect falters. A weird abstract duck floats around below the useful information – strikes, the clock, and which puzzle you are working – and is occasionally animated to be rolling or flying around. When focused on the puzzle, it isn’t too distracting. The background image of each puzzle hints at the subject matter of the puzzle, which is nice, but when used as a backdrop for the completed collection of images with that subject, the background image is given a rather random, not terribly clever title that makes me doubt some of the professionalism of this release. The background music for each level can get old after a little while, but thankfully, in the options screen, this can be changed around, even to some tracks of nature sounds like forests and rain. I spent about two weeks playing through all of the main puzzles, and I played this game pretty intensely. It’s a game that is probably best enjoyed more casually, though. I recommend not rushing through it or you might burn yourself out on it; do a couple puzzles a day and move on to something else. Either way, however, it’s a solid game and you’ll be guaranteed to get your money’s worth out of it.